IPG Editor Bob Neubauer (left) was joined by a panel of in-plant managers, from left, Adam Broadfoot, Business Process Officer, World Bank Group, Washington, D.C.; Brian Hindal, Print Production Specialist, Mayo Clinic, Rochester, Minn.; and Rick Maisonneuve, Production Manager, Pearl River Resort, Choctaw, Miss. At the recent SGIA Expo in Las Vegas, In-plant Graphics brought together dozens of in-plant managers for a breakfast session that was both informative and interactive. Managers from all over the country assembled to hear a panel of speakers talk about innovative wide-format applications their shops are producing, after which audience members held a free-form discussion of other in-plant issues that was so engaging that no one wanted to leave the room. IPG Editor Bob Neubauer opened the breakfast by presenting the findings of a new study conducted by In-plant Graphics and SGIA. The report covered trends in wide-format installations at in-plants. 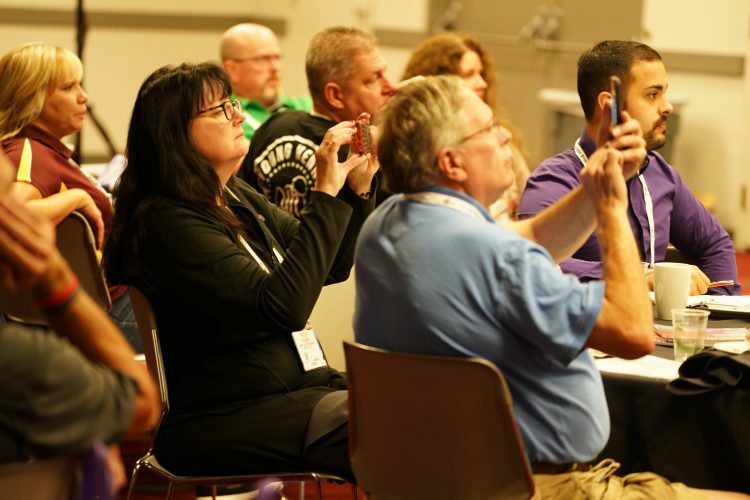 Attendees packed the room at the "In-Plant Breakfast & Wide-Format Discussion" session during the 2018 SGIA Expo. According to the results, 72% of in-plants are using wide-format. The 28% of shops that have not invested in this technology may be relying on outsourcing for their current needs. But as Neubauer noted, “this is a great opportunity to pursue.” The survey also said that 32% of respondents have two wide-format printers, and a majority reported increases in wide-format volumes in the last 12 months. Neubauer showed a variety of applications produced by in-plants, including those at Colorado School District #11, University of Texas-Austin, Sacramento State, Regional Health and Villanova University. Adam Broadfoot, Business Process Officer, World Bank Group, Washington, D.C.
In-plant attendees capture photos of the in-plant breakfast discussion. Each began his remarks by talking about their background in the industry, before moving on to the capabilities and equipment used in their shops, and the products that they’ve created. Maisonneuve, for example, heads a new in-plant that has produced eye-catching graphics for a hospital’s elevator doors. And for a restaurant with windows facing the sun, window graphics cut heat while still allowing customers to see out. Hindal’s shop supports many Mayo Clinic campuses and hospitals with dozens of employees producing directional signage, paper and fabric posters, among other things. Wide-format work he showcased included a reproduction, using stainless steel as a substrate, of a U.S. postage stamp honoring the Mayo Brothers for an installation at the Rochester (MN) Civic Center following a recent renovation. “We noticed how much work was going outside and we realized we had to keep up with the trends,” said Broadfoot of his operation. Recent purchases, like a hybrid flatbed in June 2018, have created “an immediate increase in efficiency,” he noted. Jobs like producing a banner for a catwalk that used to require 3-to-3-1/2 hours are now done in 1-to-1-1/2 hours, he said. The in-plant is still in the early stages of finding out about future capabilities and opportunities, and possibly new business lines. Attendees lingered long beyond the last presentation to ask each other questions about in-plant marketing efforts and unique wide-format projects. The session was a big success and is sure to be repeated at next year's PRINTING United event in Dallas.